With over 17,000 LPNs working throughout North Carolina, licensed practical nursing has become a popular career choice for those seeking to enter the medical field. These nurses work in various health care settings, including nursing homes, ambulatory care service facilities, and hospitals. The first step to becoming an LPN typically begins in the classroom, and students in North Carolina will find certificate and diploma options at colleges across the state. This page discusses the education options for licensed practical nurses, and includes information on state licensing, salary potential, and where the most LPN jobs can be found in North Carolina. LPNs must work efficiently and effectively to provide good patient care under the supervision of a registered nurse. This work comes with a lot of responsibilities, and as a result, requires specialized training. In North Carolina, students have a choice of several LPN training programs throughout the state that are offered at community colleges and technical schools. To compare programs, schools and tuition costs, use the search tool below. Attending nursing school can be challenging, but that is only one hurdle that LPNs must jump over in order to practice in North Carolina. After graduation, prospective nurses must go through the licensing process and meet the requirements set forth by the North Carolina Board of Nursing. This section provides information on those requirements and the LPN licensing procedure. Complete the license by examination application and submit it to the Board four to six weeks before graduating from a nursing program. LPNs are required to graduate from a school that has been approved by the state. Register for and successfully pass the NCLEX-PN, which is administered by Pearson VUE. In-state nursing school graduates must have their program director send a program verification form. Out-of-state students must arrange to have official nursing school transcripts sent to the Board of Nursing. 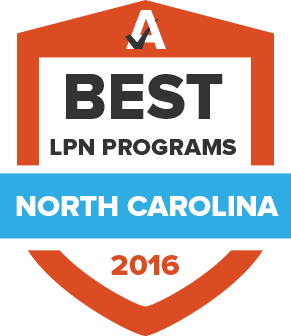 LPN licenses are renewed every two years in North Carolina. In order to successfully renew a license, nurses must complete the continuing competency requirements, which can be fulfilled by taking 30 hours of continuing education classes, completing a Board-approved refresher course, or completing 640 hours of work experience and 15 hours of continuing education. Like other nursing professionals, an LPNs salary is largely driven by where they choose to work. This section provides salary data for nurses in different geographical areas in North Carolina, as well as a comparison of nursing salaries on the state and national level. Although LPNs can work in a number of health care settings, some types of employers have more opportunities than others. Continue reading to get data on where North Carolina LPNs find jobs, what areas of nursing they specialize in, and what level of education they generally receive. Provides information on how nurses from other states can get a license by endorsement through the North Carolina nursing board. This page includes information on the legal responsibilities of LPNs in North Carolina. Includes employment statistics about LPNs from the North Carolina Board of Nursing. Founded in 1903, the North Carolina Board of Nursing oversees the state’s nursing profession and education programs. LPNs can find important news and announcements, as well as information on licensure, education, and the state’s nursing practice in general. Founded in 1902, the North Carolina Nurses Association promotes nurses by helping them provide quality patient care in facilities around the state. In order to deliver this support, the organization offers education, networking opportunities, and industry news. This report includes information about enrollment and graduation statistics from nursing schools around the state. This report provides licensing statistics for nurses in the state. The Board of Nursing provides information about the NCLEX pass rates for all nursing schools in North Carolina. This site provides information about what the state expects from LPNs working in North Carolina, including decision making methodologies.